Please complete the form below to register your workbook. 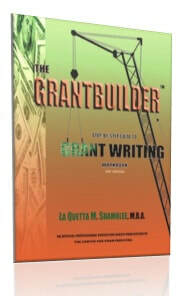 2) Announcements to participate in an introductory, complimentary "Ask The Grantbuilder" Mentoring Program. 3) E-updates on upcoming Grantbuilder workshops, webinars and new learning materials. Once we cross reference your information with our records, we will follow-up with you via email within 48 hours.